Quick, warm, delicious mash made in under 10 minutes -no cooking required! Cinnamon is high in fiber, iron, calcium, manganese and it gives relief to arthritis pain. Brimming with important nutrients for parrots, Quick Serve is simple to prepare - no cooking required! Pour desired amount of Quick Serve into a bowl. Add boiled water. Cover, soak for 5 minutes, cool and serve. Then sit back, relax and watch the tails up reaction of your birds. Quick Serve is ideal for parrot owners with hectic work schedules. 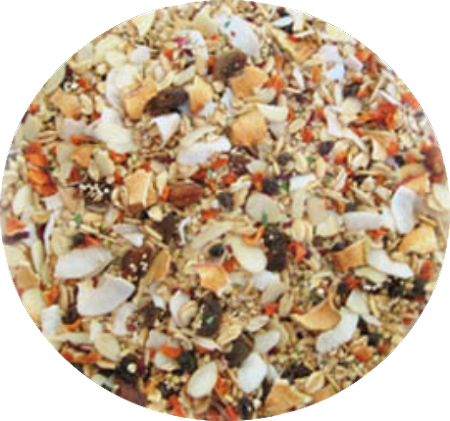 Buckwheat, KAMUT® Brand flakes, quinoa, fruits, nuts, and seeds are spiced with beneficial, aromatic herbs and Ceylon cinnamon. Sold in 350 gram packages. Cinnamon is high in fiber, iron, calcium and manganese. It can be used as a treatment for fungals, and other types of yeast and aspergillus. It gives relief to arthritis pain. Since it has anti-bacterial properties, it helps to lessen the growth of bacterias on fresh food.